Diffuse reflectance spectroscopy (DRS) is being used in exploratory clinical applications such as cancer margin assessment on excised tissue. However, when interrogating nonplanar tissue anomalies can arise from non-uniform pressure. Herein is reported the design, fabrication, and test of flexible, thin film silicon photodetectors (PDs) bonded to a flexible substrate designed for use in conformal DRS. The PDs have dark currents and responsivities comparable to conventional Si PDs, and were characterized while flat and while flexed at multiple radii of curvature using liquid phantoms mimicking adipose and malignant breast tissue. The DRS and nearest neighbor crosstalk results were compared with Monte Carlo simulations, showing good agreement between simulation and experiment. A. Chagpar, T. Yen, A. Sahin, K. K. Hunt, G. J. Whitman, F. C. Ames, M. I. Ross, F. Meric-Bernstam, G. V. Babiera, S. E. Singletary, and H. M. Kuerer, “Intraoperative margin assessment reduces reexcision rates in patients with ductal carcinoma in situ treated with breast-conserving surgery,” Am. J. Surg. 186(4), 371–377 (2003). B. S. Nichols, N. Rajaram, and J. W. Tunnell, “Performance of a lookup table-based approach for measuring tissue optical properties with diffuse optical spectroscopy,” J. Biomed. Opt. 17(5), 0570011 (2012). D. Contini, F. Martelli, and G. Zaccanti, “Photon migration through a turbid slab described by a model based on diffusion approximation. I. Theory,” Appl. Opt. 36(19), 4587–4599 (1997). R. M. P. Doornbos, R. Lang, M. C. Aalders, F. W. Cross, and H. J. C. M. Sterenborg, “The determination of in vivo human tissue optical properties and absolute chromophore concentrations using spatially resolved steady-state diffuse reflectance spectroscopy,” Phys. Med. Biol. 44(4), 967 (1999). J. Bender, K. Vishwanath, L. Moore, J. Brown, V. Chang, G. Palmer, and N. Ramanujam, “A robust Monte Carlo model for the extraction of biological absorption and scattering in vivo,” IEEE Trans. Biomed. Eng. 56(4), 960–968 (2009). C. Zhu, G. M. Palmer, T. M. Breslin, J. Harter, and N. Ramanujam, “Diagnosis of breast cancer using diffuse reflectance spectroscopy: Comparison of a Monte Carlo versus partial least squares analysis based feature extraction technique,” Lasers Surg. Med. 38(7), 714–724 (2006). G. M. Palmer and N. Ramanujam, “Monte Carlo-based inverse model for calculating tissue optical properties. Part I: Theory and validation on synthetic phantoms,” Appl. Opt. 45(5), 1062 (2006). G. M. Palmer, C. Zhu, T. M. Breslin, F. Xu, K. W. Gilchrist, and N. Ramanujam, “Monte Carlo-based inverse model for calculating tissue optical properties Part II: Application to breast cancer diagnosis,” Appl. Opt. 45(5), 1072 (2006). A. Garcia-Uribe, J. Zou, M. Duvic, J. H. Cho-Vega, V. G. Prieto, and L. V. Wang, “In vivo diagnosis of melanoma and nonmelanoma skin cancer using oblique incidence diffuse reflectance spectrometry,” Cancer Res. 72(11), 2738–2745 (2012). N. Subhash, J. R. Mallia, S. S. Thomas, A. Mathews, P. Sebastian, and J. Madhavan, “Oral cancer detection using diffuse reflectance spectral ratio R540/R575 of oxygenated hemoglobin bands,” J. Biomed. Opt. 11(1), 014018 (2006). 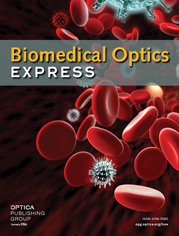 R. A. Schwarz, W. Gao, D. Daye, M. D. Williams, R. Richards-Kortum, and A. M. Gillenwater, “Autofluorescence and diffuse reflectance spectroscopy of oral epithelial tissue using a depth-sensitive fiber-optic probe,” Appl. Opt. 47(6), 825 (2008). G. Zonios, L. T. Perelman, V. Backman, R. Manoharan, M. Fitzmaurice, J. Van Dam, and M. S. Feld, “Diffuse reflectance spectroscopy of human adenomatous colon polyps in vivo,” Appl. Opt. 38(31), 6628 (1999). H.-W. Wang, J.-K. Jiang, C.-H. Lin, J.-K. Lin, G.-J. Huang, and J.-S. Yu, “Diffuse reflectance spectroscopy detects increased hemoglobin concentration and decreased oxygenation during colon carcinogenesis from normal to malignant tumors,” Opt. Express 17(4), 2805 (2009). Z. Volynskaya, A. S. Haka, K. L. Bechtel, M. Fitzmaurice, R. Shenk, N. Wang, J. Nazemi, R. R. Dasari, and M. S. Feld, “Diagnosing breast cancer using diffuse reflectance spectroscopy and intrinsic fluorescence spectroscopy,” J. Biomed. Opt. 13(2), 024012 (2008). S. Kennedy, J. Geradts, T. Bydlon, J. Q. Brown, J. Gallagher, M. Junker, W. Barry, N. Ramanujam, and L. Wilke, “Optical breast cancer margin assessment: an observational study of the effects of tissue heterogeneity on optical contrast,” Breast Cancer Res. 12(6), R91 (2010). N. Lue, J. W. Kang, C.-C. Yu, I. Barman, N. C. Dingari, M. S. Feld, R. R. Dasari, and M. Fitzmaurice, “Portable optical fiber probe-based spectroscopic scanner for rapid cancer diagnosis: a new tool for intraoperative margin assessment,” PLOS ONE 7(1), e30887 (2012). S. Dhar, J. Lo, B. Yu, M. Brooke, N. Ramanujam, and N. Jokerst, “Custom annular photodetector arrays for breast cancer margin assessment using diffuse reflectance spectroscopy,” in 2011 IEEE Biomedical Circuits and Systems Conference (BioCAS), (IEEE, 2011), pp. 440–443. B. S. Nichols, A. Llopis, G. M. Palmer, S. S. McCachren, O. Senlik, D. M. Miller, M. Brooke, N. M. Jokerst, J. Geradts, R. Greenup, and N. Ramanujam, “Miniature spectral imaging device for wide-field quantitative functional imaging of the morphological landscape of breast tumor margins,” J. Biomed. Opt. (to be published). O. Senlik, G. Greening, T. J. Muldoon, and N. M. Jokerst, “Spatially resolved diffuse reflectance spectroscopy of two-layer turbid media using a densely packed multi-pixel photodiode probe,” Proc. SPIE 9700, 97000O (2016). R. A. Graham, M. J. Homer, J. Katz, J. Rothschild, H. Safaii, and S. Supran, “The pancake phenomenon contributes to the inaccuracy of margin assessment in patients with breast cancer,” Am. J. Surg. 184(2), 89–93 (2002). H. Shangguan, S. A. Prahl, S. L. Jacques, L. W. Casperson, and K. W. Gregory, “Pressure effects on soft tissues monitored by changes in tissue optical properties,” Proc. SPIE 3254, 366–371, (1998). R. Reif, M. S. Amorosino, K. W. Calabro, O. A’Amar, S. K. Singh, and I. J. Bigio, “Analysis of changes in reflectance measurements on biological tissues subjected to different probe pressures,” J. Biomed. Opt. 13(1), 010502 (2008). L. Lim, B. Nichols, N. Rajaram, and J. W. Tunnell, “Probe pressure effects on human skin diffuse reflectance and fluorescence spectroscopy measurements,” J. Biomed. Opt. 16(1), 011012 (2011). N. Johnson and A. Chiang, “Highly photosensitive transistors in single-crystal silicon thin films on fused silica,” Appl. Phys. Lett. 45(10), 1102–1104 (1984). R. Wu, J. Boyd, H. Timlin, H. E. Jackson, and J. L. Janning, “Optical waveguide detection: photodetector array formed on the waveguide utilizing laser recrystallized silicon,” Appl. Phys. Lett. 46(5), 498–500 (1985). S. Dhar, D. M. Miller, and N. M. Jokerst, “High responsivity, low dark current, heterogeneously integrated thin film Si photodetectors on rigid and flexible substrates,” Opt. Express 22(5), 5052 (2014). J. Yoon, A. J. Baca, S.-I. Park, P. Elvikis, J. B. Geddes, L. Li, R. H. Kim, J. Xiao, S. Wang, T.-H. Kim, M. J. Motala, B. Y. Ahn, E. B. Duoss, J. A. Lewis, R. G. Nuzzo, P. M. Ferreira, Y. Huang, A. Rockett, and J. A. Rogers, “Ultrathin silicon solar microcells for semitransparent, mechanically flexible and microconcentrator module designs,” Nature Materials 7(11), 907–915 (2008). H.-C. Yuan, J. Shin, G. Qin, L. Sun, P. Bhattacharya, M. G. Lagally, G. K. Celler, and Z. Ma, “Flexible photodetectors on plastic substrates by use of printing transferred single-crystal germanium membranes,” Appl. Phys. Lett. 94(1), 13102 (2009). S. Dhar, J. Y. Lo, G. M. Palmer, M. A. Brooke, B. S. Nichols, B. Yu, N. Ramanujam, and N. M. Jokerst, “A diffuse reflectance spectral imaging system for tumor margin assessment using custom annular photodiode arrays,” Biomed. Opt. Express 3(12), 3211 (2012). T. M. Bydlon, S. A. Kennedy, L. M. Richards, J. Q. Brown, B. Yu, M. K. Junker, J. Gallagher, J. Geradts, L. G. Wilke, and N. Ramanujam, “Performance metrics of an optical spectral imaging system for intra-operative assessment of breast tumor margins,” Opt. Express 18(8), 8058 (2010). C. Mätzler, “MATLAB functions for Mie scattering and absorption, version 2,” Tech. Rep. Res. Rep. 2002–11, Institut für Angewandte Physik, Bern, Switzerland (2002). S. Dhar, “Development of Custom Imaging Arrays for Biomedical Spectral Imaging Systems,” Ph.D. dissertation, Dept. Elec. Comp. Eng., Duke Univ., Durham, NC, 2012. Sterenborg, H. J. C. M.
Fig. 1 Illustration of thin film flexible PDs bonded to a flexible substrate. The DRS probe contains two flexible thin film Si PDs with center-to-center separation of 4.5 mm. Fig. 2 Image of the flexible PD probe bent cylindrically outward, bending radius of 15 mm. Fig. 3 (a) Surface normal responsivity of PD1 at multiple bend radii; (b) Dark current characterization of PD1 at multiple bend radii. Fig. 4 Absorption (μa, dotted lines) and scattering (μs, solid lines) coefficients of the liquid phantoms representing adipose (red lines) and malignant (blue lines) breast tissue. Fig. 5 Left: Illustration of liquid phantom testing at 10 mm radius of curvature: (a) Top clamp, with hollow region to contain liquid phantom and curved bottom edges; (b) Transparent PET film; (c) Flexible PDs on Kapton; (d) Bottom clamp, with curvature matching the top clamp. Right: Photograph of 10 mm bending radius test apparatus. Fig. 6 DRS reflectance versus wavelength for both benign and malignant phantoms at fourteen wavelengths and three radii of curvature. Fig. 7 Crosstalk reflectance for the benign phantom. All five radii of curvature were measured. Fig. 8 Experimental DRS signal (malignant phantom: red open circles, benign phantom: black open triangles) compared to Monte Carlo simulations (malignant phantom: red filled circles, benign phantom: black filled triangles) versus wavelength for the (a) flat test case and (b) 10 mm radius of curvature test case. Fig. 9 Experimental crosstalk reflectance (open triangles) compared to Monte Carlo simulations (filled triangles) for the benign phantom at five radii of curvature. Fig. 10 Signal contrast between benign and malignant phantom reflectance at flat and flexed conditions. Fig. 11 DRS signal (open circles) of (a) benign phantom; and (b) malignant phantom, compared to Monte Carlo simulations (filled circles) versus curvature (inverse of radius) at five wavelengths. Linear regression (dashed lines) shown for simulated data.